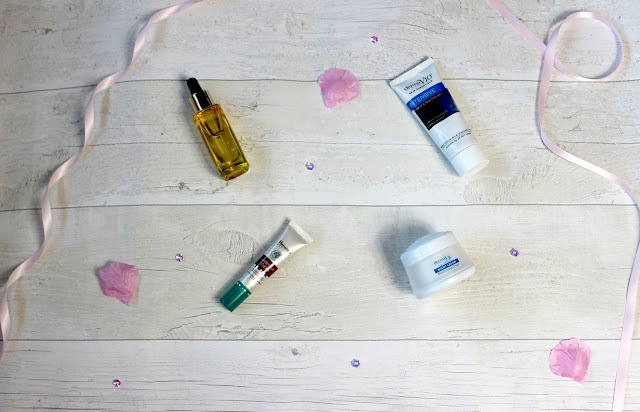 So today I thought I would share my current skincare routine with you as I’m trying my best to get into skincare this year and using these products I’ve definitely seen a difference. I will start this off by explaining my skin just in case your new to my blog, I have oily/combination skin which does go quite dry towards the summer months. I suffered from acne when I was 15 and was put on a steroid cream which cleared my skin up massively. I still get the odd breakouts but that’s if I’m stressed or if it’s the time of the month. As I said 2018 is the year I’m starting to look after myself and my skin is definitely one of them so I thought I would share my current skincare routine as this has improved my skin massively, this routine may change throughout the year when I try new products but for now I’ve tested these and fallen in love. Simple Micellar Cleansing Water – I use this to make sure all my make-up has been removed, I do use face wipes to remove the bulk of my make-up which I know they aren’t the greatest product to use but I find them easier, I then go in with this on a cotton pad to just get rid of the rest of my make-up. 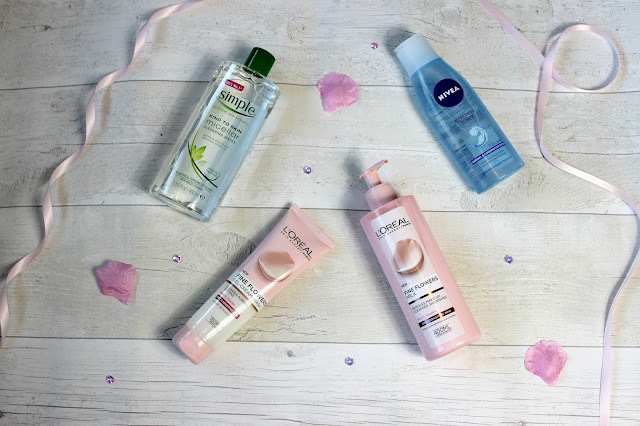 L’Oreal Fine Flower Gel – Cream Wash – I then wash my face with this cream wash and if I’m honest I adore these products by L’Oreal as the scent is just so lovely, I love the pink packaging but also it’s just such a gentle wash it’s lovely. L’Oreal Fine Flowers Milk – I use this on a cotton pad and again just swipe across my face to make sure all my make-up is fully gone. Again the packaging is lovely, the scent is amazing and it’s such a gentle product which you get 400ml of this so it will last me such a long time. Nivea Refreshing Toner – I then go in with the Nivea toner which I have to say I don’t really see much difference when I use this but I love the scent of the Nivea skincare products, I have recently picked up the one which is in the same range by L’Oreal as the other two products but I’m still giving that a trial period so that’s why I didn’t add that into this post. L’Oreal Extraordinary Facial Oil – I picked this up a while ago as I had seen quite a few reviews on it and decided to pick it up, I just apply this on my clean face and down my neck. Derma V10 Night Cream – So first off the writing on the packaging has now smudged which is kind of annoying but I guess that proves I’ve been using this constantly, Again I am giving a trial period to the L’Oreal Hydra Genius Aloe Water so I will give my thoughts on that soon but I apply that before I apply the Derma V10 cream which I’ve already reviewed this but I just apply to my face and neck. Himalaya Under Eye Cream – I got this from Ebay as I wanted an under eye cream I mean it does the job and I feel as though I’ve seen a difference to my under eyes but I’m not sure if that’s just in my mind but I just apply this and rub it in, I am looking for a better one so any recommendations are welcome. Derma V10 Intensive Hand Cream – I got this hand cream from the £1 shop the same time as I picked the face cream up and I just apply this on a night time to my hands when I take my rings off and I have definitely seen a difference with my hands by applying this on a night time. So as I said I have definitely seen a difference to my skin by using these products as I said I am giving trial periods to the L’Oreal toner and the L’Oreal Hydra Genius Aloe Water so once I have fully tested these out I will review them on my blog to let you know how I’m getting on with them. Do you use any of these products and do you have any under eye cream recommendations?